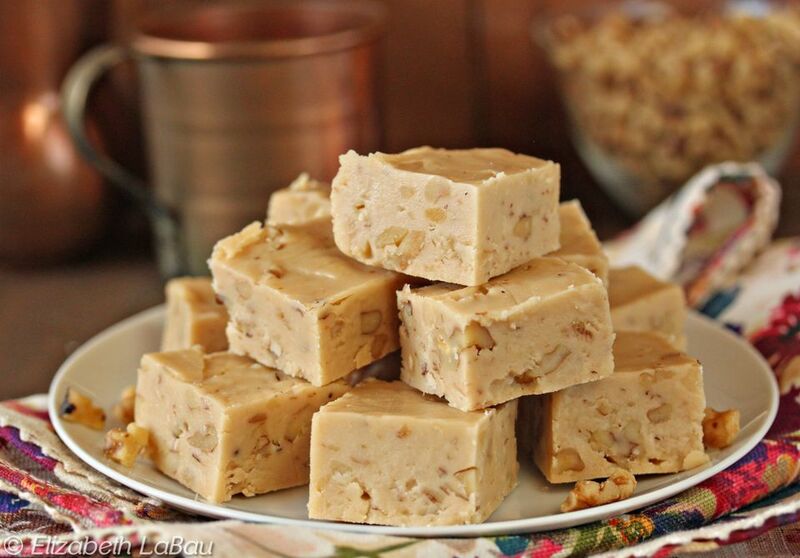 Maple walnut fudge has a silky-smooth texture and a wonderful fall flavor. It's made with real maple syrup and crunchy toasted walnuts, resulting in a delicious, unique fudge that is sure to grab attention. This recipe is a flavor variation on old-fashioned fudge. Since it uses the traditional method, you will need a good candy thermometer to make it. It's an essential tool for ensuring your fudge reaches a specific temperature to avoid any of the common fudge problems. Also, be sure to carefully follow the instructions for cooling and beating the fudge so your candy comes out perfectly. Prepare an 8- by 8-inch pan by lining it with aluminum foil and spraying the foil with nonstick cooking spray. In a medium heavy-bottomed pan over medium-high heat, place the maple syrup, cream, sugar, salt, and corn syrup. Stir until the fudge comes to a boil, then insert a candy thermometer and cook, stirring occasionally, until it reads 238 F.
Remove the pan from the heat and pour the candy into the bowl of a large standing mixer. Alternately, you can use a hand mixer and pour it into any large bowl. Wash the candy thermometer to remove stray sugar crystals, then insert it into the hot candy. Allow the candy to cool, without stirring or disturbing it in any way, until the temperature reduces to 110 F. This may take over an hour, depending on the temperature of your kitchen. Once the fudge reaches 110 F, add the vanilla and beat it with the paddle attachment of the electric mixer on medium-low speed. Watch it closely, and beat just until it starts to thicken and lose its gloss. It should gradually become thicker and take on the texture of cake frosting. This process might take anywhere from 5 to 15 minutes, depending on your mixer. If you have beaten it too much and it gets too thick to stir, add a spoonful or two of very hot water and stir to loosen it. Once the fudge is thickened but not set, stir in the toasted nuts, and scrape it into the prepared pan. Spread it into a smooth, even layer and allow it to set completely at room temperature for an hour. Once set, remove the fudge from the pan using the foil as handles. Cut it into small one-inch squares. Be sure to use real maple syrup, not maple-flavored "pancake syrup" or other imitation syrups. Maple walnut fudge can be stored in an airtight container at room temperature for up to a week. If you don't have walnuts, you can substitute pecans or hazelnuts in this fudge.